Please enter the following in the appropriate fields: Surname, Given name, age and Town of Origin. If town of origin contains two towns (usually the second is in parenthesis), then put both towns separated by a comma. If a field is unclear or empty, enter a ? in that field. Note that the age in the fields is inconsistent - most of the records show the age, some of them show the last two digits from the year of birth (i.e. 39 means 1939). So if the number shown is under 18, then this is the age. If the number is higher, then this the birth year. 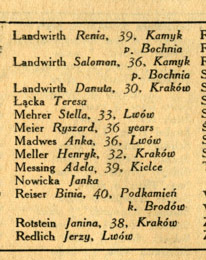 Since this list was compiled in 1945, subtract the birth year from 1945 to arrive at the age.